With real estate prices rising in all the market segments of Las Vegas, it’s even more difficult to find a decent return on cash. Single family properties have risen in price by as much as 50% from the bottom of the market while rents are slowly climbing. By using some real numbers among a range of property types, the list below shows what we are recommending for 2018. These are sorted by recommendations. Multi family is at the bottom of the cash return / appreciation list. 7% ROI, 9% appreciation – These mom and pop strip malls in “E” neighborhoods are undervalued. We highly recommend these. Unfortunately, it’s a very steep entry. They start close to $1M. These also have the least amount of brain damage. Tenants are often on 3-5 year leases and pay for EVERYTHING (utilities, taxes, insurance, maintenance etc). Airbnb (15% ROI, 7 % appreciation). We do not have a complete list of Airbnbs or annual reports to provide but preliminary results are giving us excellent returns. This property is currently generating about a 15% return on cash. Purchasing the right Airbnb in a location that can be licensed is super important. Be sure to read Airbnb FAQs before you go down this path. WARNING – As of 2/1/2018, it’s a “seller’s market” and you have to offer over list to get properties. Lease Options (6% ROI, 7% appreciation). Year after year, these lease/options perform well when tenants do not exercise their option to purchase. Even if tenants do exercise their option, the real estate fees saved by investors make investors more money in the long run. Please read Lease/Option FAQs before you go down this path. 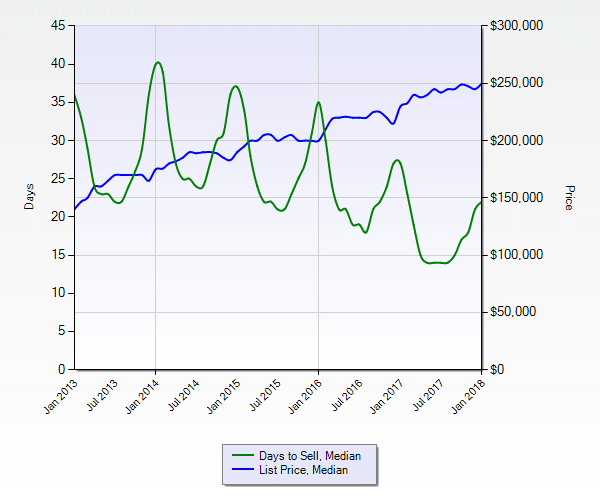 WARNING – As of 2/1/2018, it’s a “seller’s market” and you have to offer over list to get properties. Standard Rentals (2% ROI, 7% appreciation). For investors who want to hold on to their property for the long run, this isn’t too bad. We can help you identify the best type of SFR rentals available. WARNING – As of 2/1/2018, it’s a “seller’s market” and you have to offer over list to get properties. The chart below shows why I think we are headed for a downturn soon. (1% ROI, 8% appreciation) The challenge we are having here is the unpredictability of returns. Some of our multi family properties print cash while others are bleeding investors to death. We get random large expenses that are impossible to predict. One bad tenant can ruin an entire building. We sold 25 of these buildings in 2017 because they are a nightmare. All our lawsuits and most of our evictions are related to Multi Family tenants. You will regret wading into that swamp. Appreciation Predictions – Chat with any of our clients and you will learn these are conservative. We are experts in identifying which properties to purchase and can assist you in repairing and placing tenants for you. Our team of specialists will carry you through our investment process from start to finish. Whether you are a seasoned veteran or if this is your first time, you can pick and choose which services you want. Don’t know if you want to flip or hold? Here is a very good article about the pros and cons. Step 1 – Determine how your assets will be held. Decide how title will be held. LLCs are recommended if you want to keep the wolves at bay. DO NOT HOLD TITLE WITH PARTNERS unless the partner is your spouse. These things blow up right about when you are too sick to deal with it or your partner runs out of money. We can send you pictures of burned out buildings if you want to see the end results of partnerships. We see tweakers light these on fire just about every week and will be happy to tell you stories of how those partners got started 20 years ago. Video. Step 2 – Determine who you will work with. Do your research on an agent or broker before you throw your life savings at this. If you really want to know what returns the best money, talk to companies who also manage them. Trusting information from a listing agent is the fastest way to get your clock cleaned. Here are our YELP reviews. Video. Step 3 – Line up your financing before traveling. The days of easy finding came to an end in the real estate crash in 2008. If you are paying cash, you will need to prove it before you can make offers. If you are getting a loan, talk to a loan professional today. If you need a referral, we have some awesome people who can help you with either residential or commercial loans. We are not going to drive around in the heat until you can show us you have the ability to purchase. Do you go to Walmart without your wallet? Neither do we. Step 4 – Arrange to go hunting for properties. Once you have some financing lined up AND you have scheduled some time to look at some properties, we will do a free, no hassle, no pressure hunting mission with you. We are not time share people and there is no reason for us to force you to buy something that will make you lose money. We will probably be managing your property so we are going to get really cozy for very long time. Step 5 – What you should be doing while in escrow. Please read this important information about The Las Vegas escrow process. This will save you lots of time and headache. You also want to get the property management ball rolling. DO NOT WAIT UNTIL IT CLOSES TO FIND A TENANT!! We offer a variety of property management services and this page covers all our property management solutions. Step 6 – Get your property ready for tenants. Do not waste time or money waiting around or making fancy upgrades. Read our Rehab 101 page for dos and don’ts. You can do your rehab or you can hire us. We charge 10% over invoice. We do about 2 rehabs a week and can probably do it much cheaper and faster than you can. Step 7 – Collect money! This page contains Tips on how to collect money efficiently, as well as FAQs on how we collect and disburse money. This page covers our eviction process in detail. Sign up here for our monthly news and recommendations.